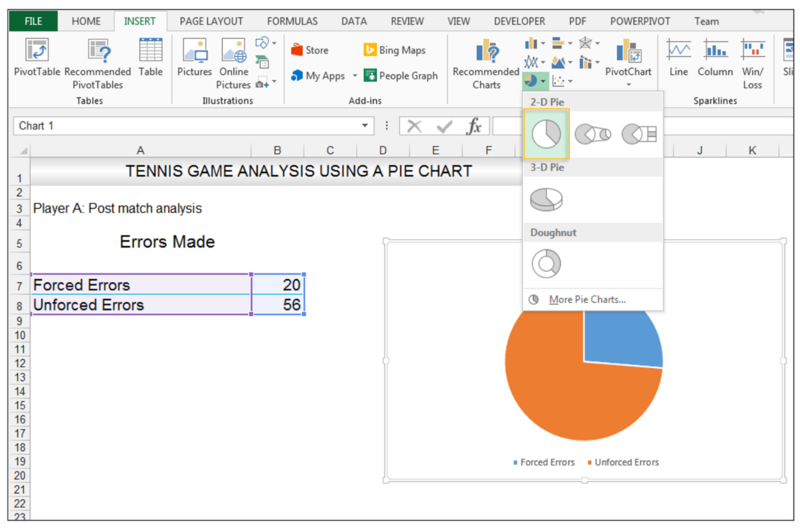 How to Make a Pie Chart in Excel & Add Rich Data Labels to The Chart! 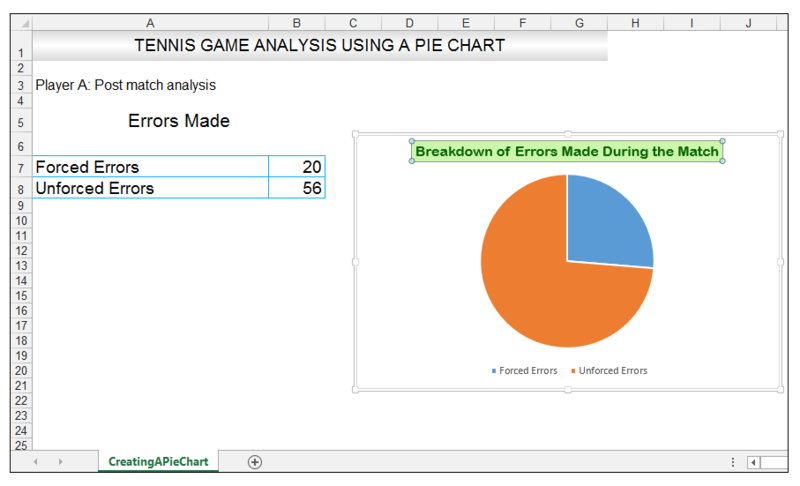 A pie chart is used to showcase parts of a whole or proportions of a whole. 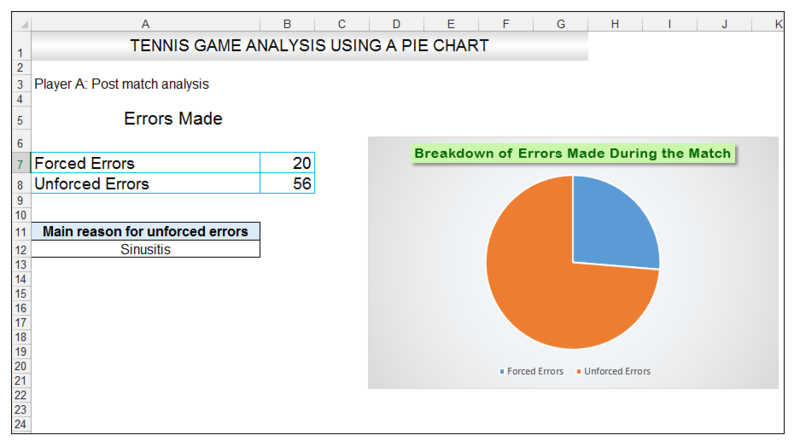 There should be about five pieces in a pie chart if there are too many slices, then it’s best to use another type of chart or a pie of pie chart in order to better showcase the data. 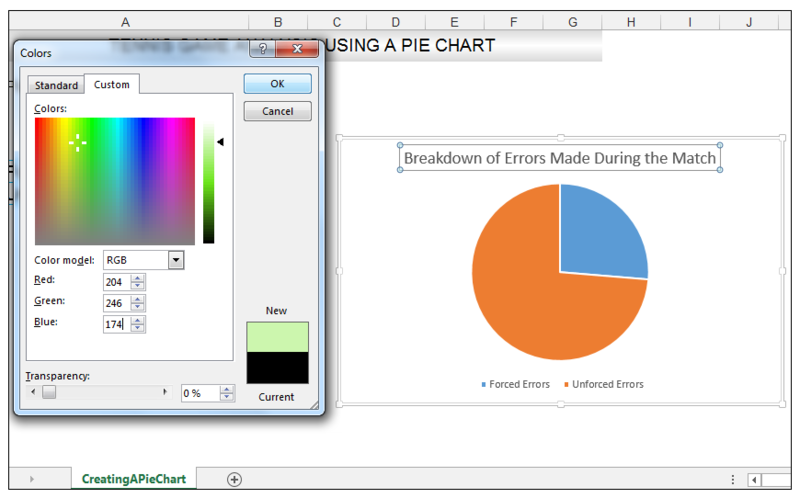 In this article, we are going to see a detail description on how to make a pie chart in excel. 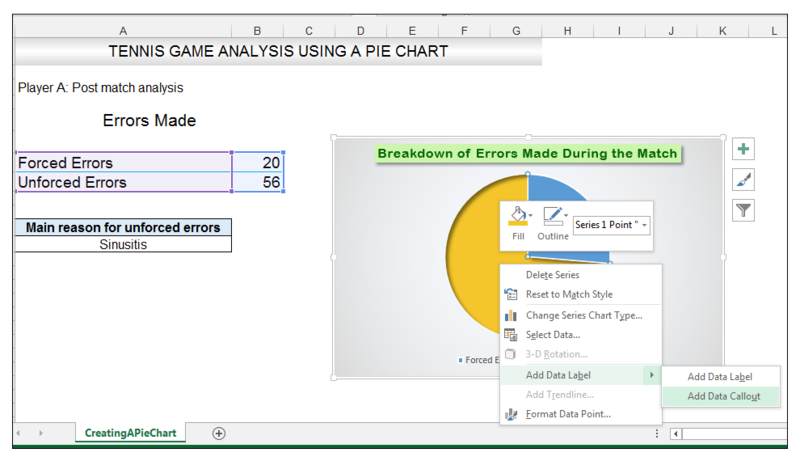 One can easily create a pie chart and add rich data labels, to one’s pie chart in Excel. 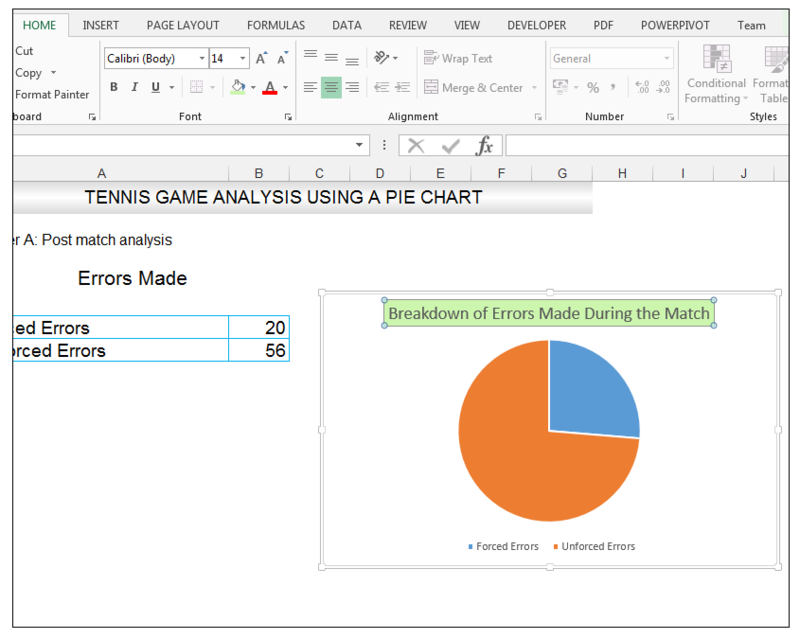 So, let’s see how to effectively use a pie chart and add rich data labels to your chart, in order to present data, using a simple tennis related example. 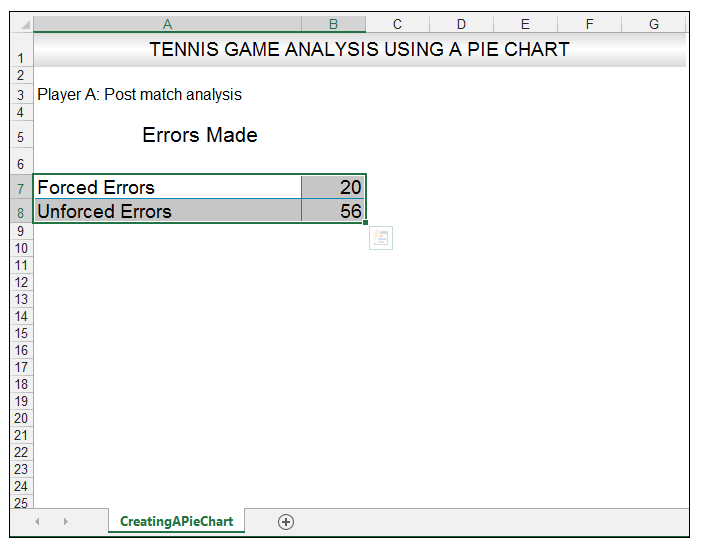 A tennis coach at a hypothetical tennis clinic is evaluating the post-game performance of his top-seeded player. 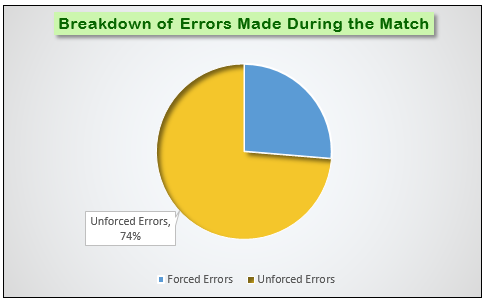 He wants to visually present the main types of errors the player made along with the unforced errors. 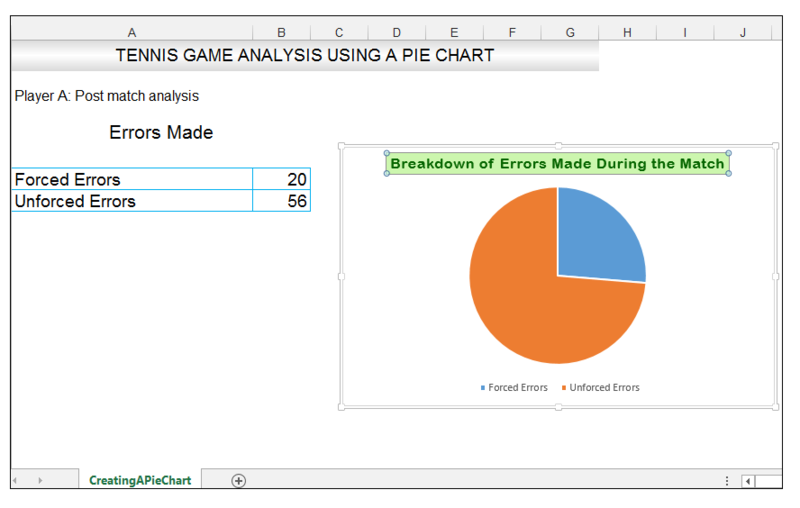 Here we will combine this two errors in a pie chart. So let`s start the procedure. 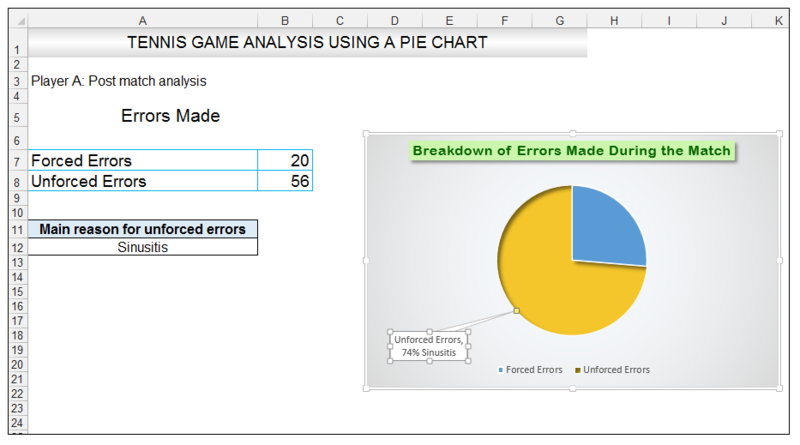 2) Go to Insert> Charts> click on the drop-down arrow next to Pie Chart and under 2-D Pie, select the Pie Chart, shown below. 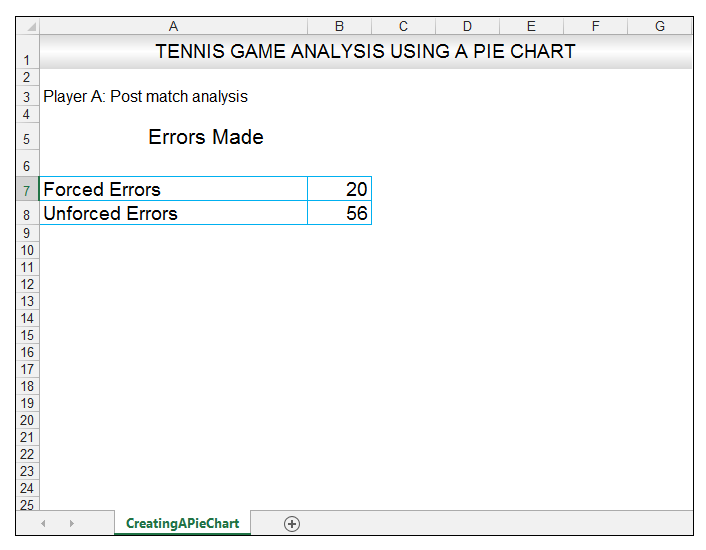 3) Chang the chart title to Breakdown of Errors Made During the Match, by clicking on it and typing the new title. 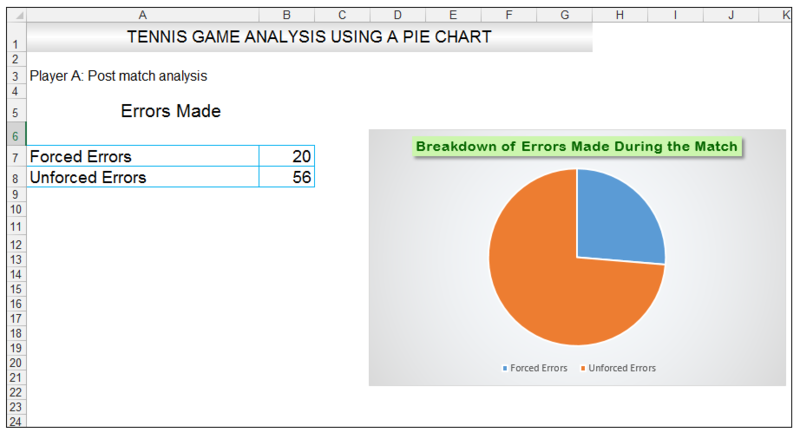 4) With the chart title still selected, go to Home>Font>click on the drop-down arrow next to fill, and Select More Colors as shown below. 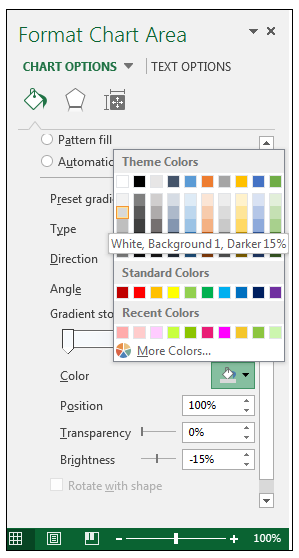 5) Select the Custom Tab, from the Colors Dialog box and enter R 204, G 246, B 174 to fill the background of the title with this light green color as shown below and then click Ok.
6) With the title still selected, go to Home>Font and change the font to Arial Rounded MT Bold, and the font size to 12 as shown below. 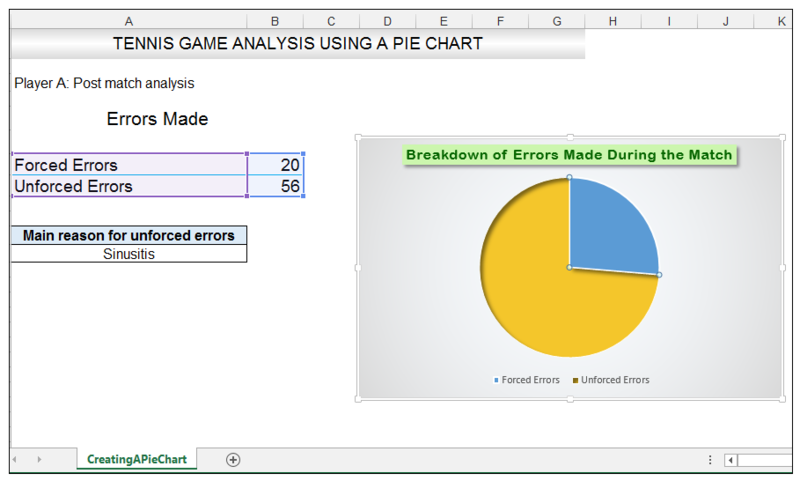 7) Change the font color of the chart title to R 7, G 102, B 0. 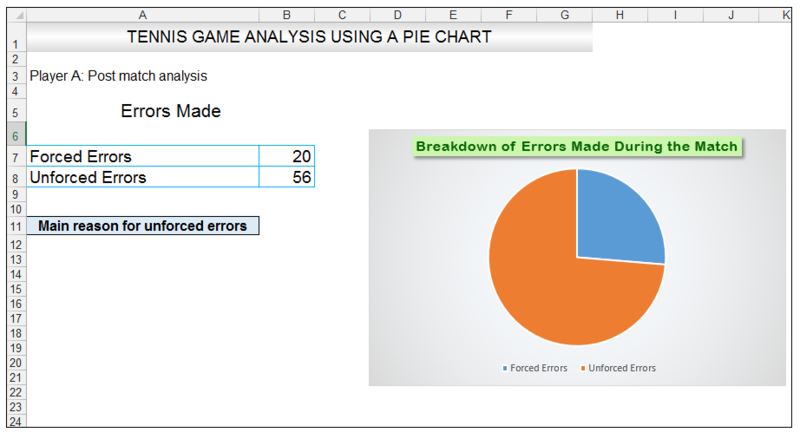 8) With the chart title still selected, go to Home>Font and expand the Font section, in order to launch the Font Dialog box. 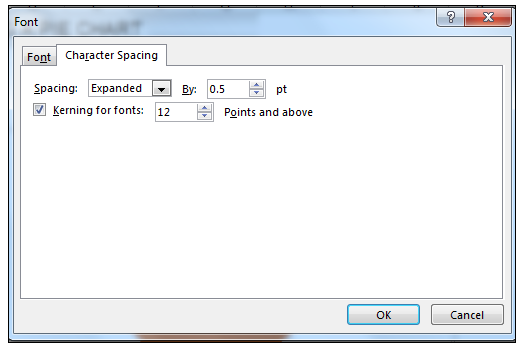 9) Select the Character Spacing Tab and change the spacing to expanded by 0.5 points as shown below, and click Ok.
10) With the chart title still selected, go to Chart Tools>Format>Shape Styles and click on the drop-down arrow next to Shape Effects, then select Shadow>Outer>Offset Diagonal Bottom Right. 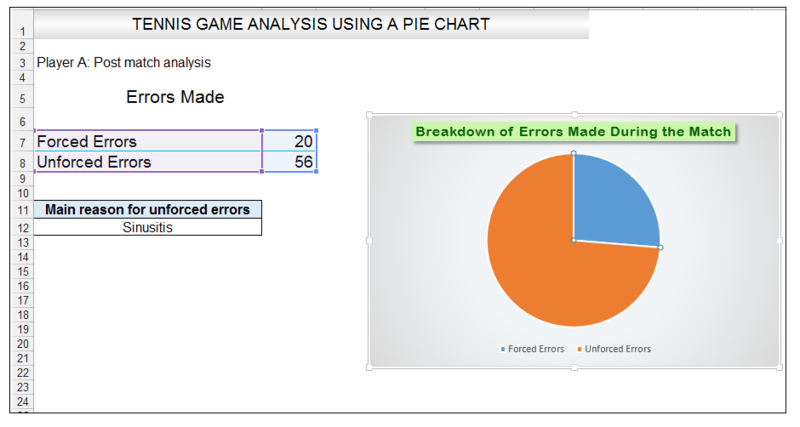 11) With the actual chart selected, right-click the chart and choose Format Chart Area. 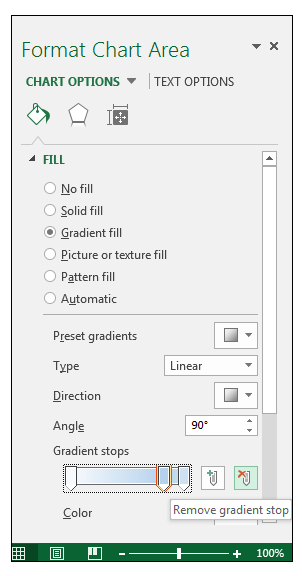 12) In the Format Chart Area Panel, go to Chart Options and check the Gradient fill option. 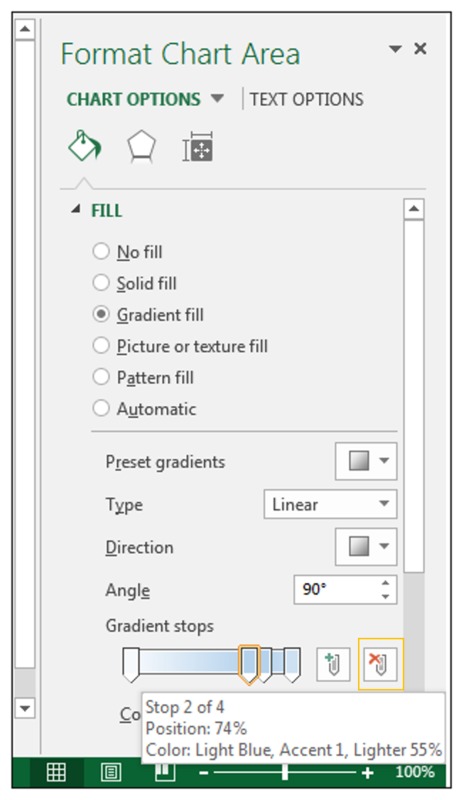 13) With the Format Chart Area Panel still open, go to the gradient stops section and click on stop 2 of 4, and then select delete gradient stop. 14) Do the same thing for the remaining stop in the middle and delete it. 15) There should now, only be two gradient stops left, so now select Stop 2 of 2 as shown below. 16) Fill this stop with the White, Background 1, Darker 15% fill as shown below. 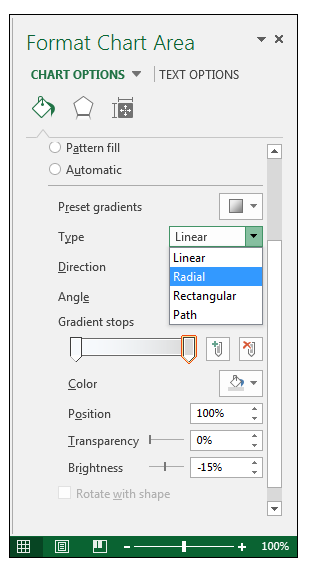 17) Change the Gradient Type to Radial. 18) Change the Direction to From Center. 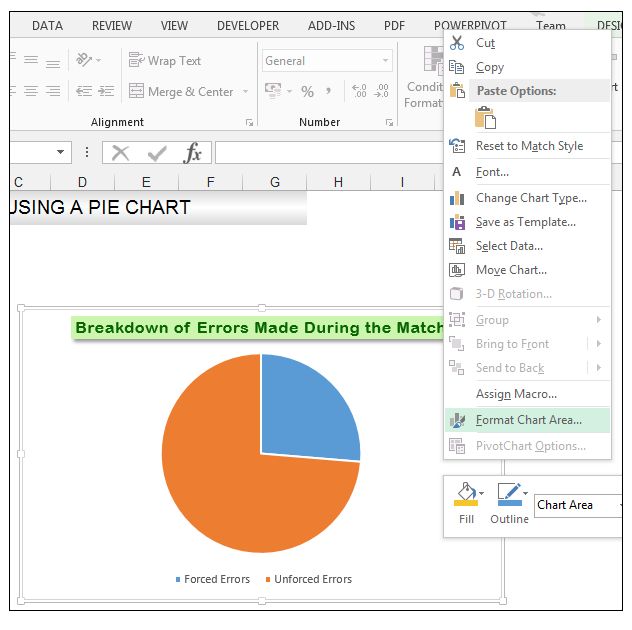 19) Close the Format Chart Area Panel. 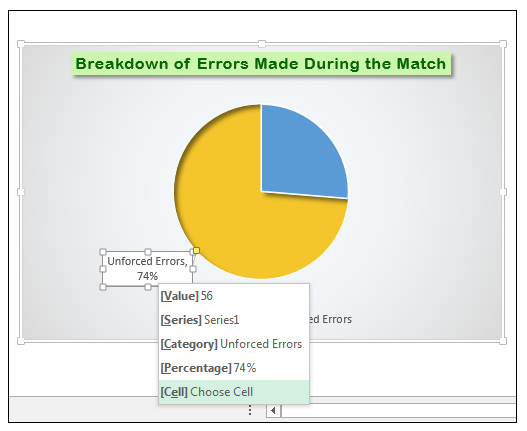 1) In cell A11, type the following text, Main reason for unforced errors and give the cell a light blue fill and a black border. 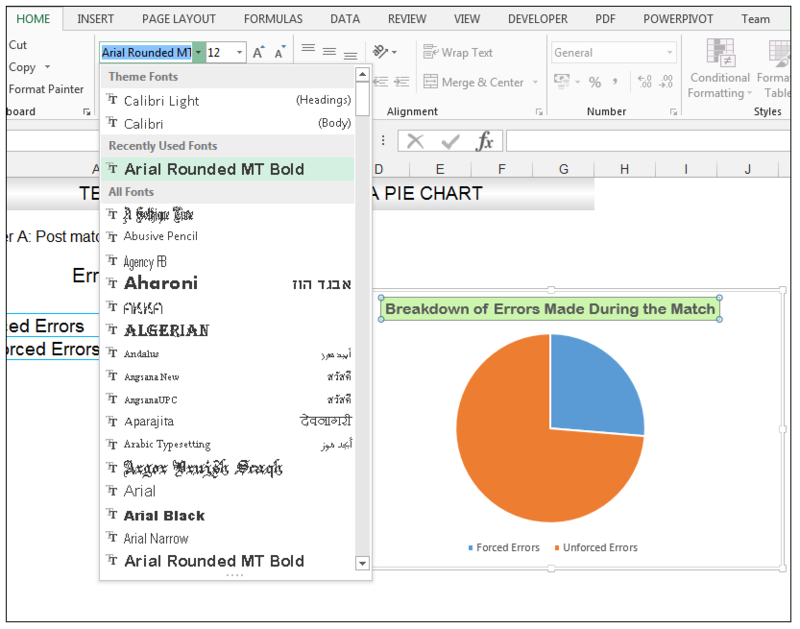 2) In cell A12, type the text Sinusitis, and give the cell a black border, and align the text to the center position. 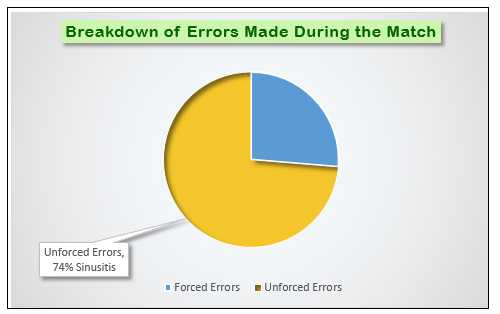 3) Select the Unforced Errors data point only, (the currently orange shaded data point), since we now only want to format this particular data point with a specific formatting. 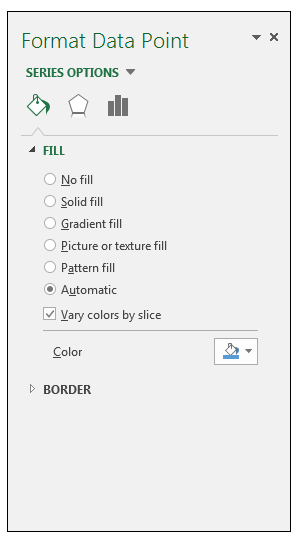 4) Go to Chart Tools>Format>Shape Styles>Click on the drop-down next to Shape Fill and select More Fill Colors. 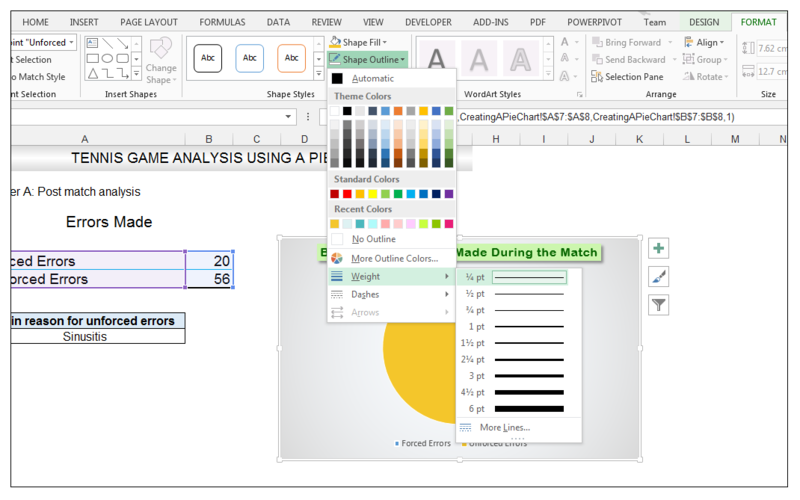 5) Select the Custom Tab, from the Colors Dialog Box, and enter the following values R 244, G, 198, B 43 and click Ok.
6) With the data point still selected, go to Chart Tools>Format>Shape Styles and click on the drop-down arrow next to Shape Outline and select Weight and change the weight of the outline to ¼ points as shown below. 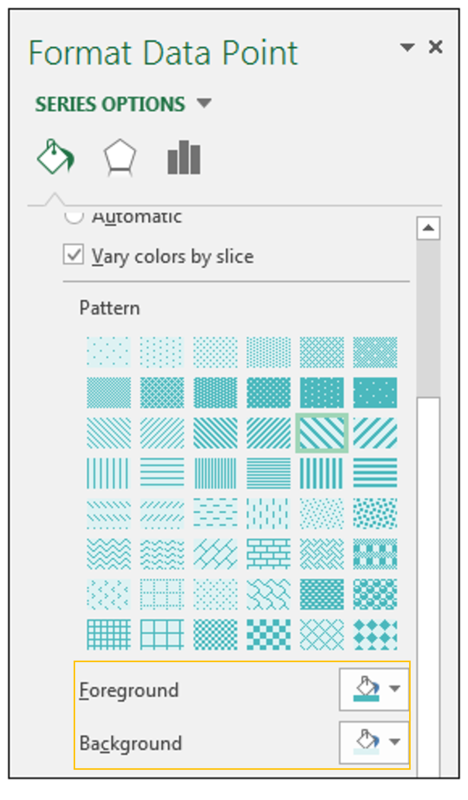 7) With the data point still selected, go to Chart Tools>Format>Shape Styles and click on the drop-down arrow next to Shape Effects and select Shadow and choose Inner Shadow>Inside Diagonal Top Left. 8) With the one data point still selected, right-click this data point, and select Add Data Label>Add Data Callout as shown below. 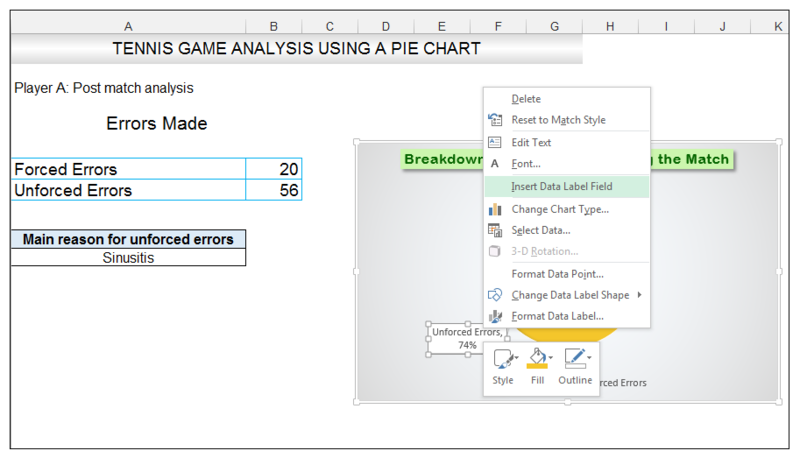 9) Select only this data label and right-click and choose Insert Data Label Field as shown below. 10) Select [Cell] Choose Cell from the options. 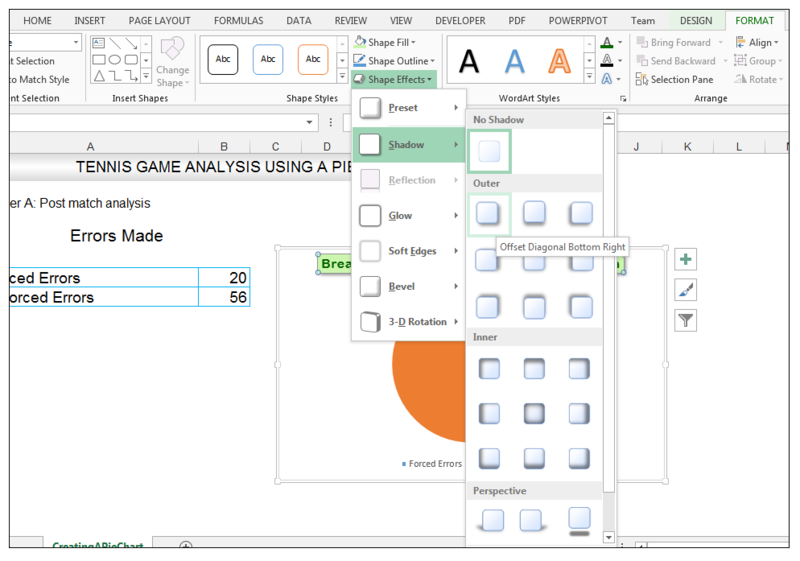 11) Select the cell reference, which in this case is cell A12, so that if one changes the value in cell A12, i.e., let’s say there was another reason the player was not performing well, then the Data Callout will automatically update based on the value in this cell. 12) Select the Data Callout and position it slightly to the left by just dragging it, and add a space between 74% and Sinusitis as shown. 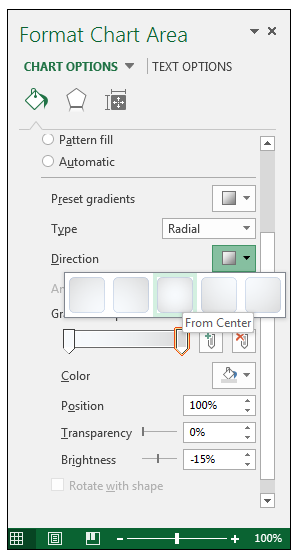 13) With the Data Callout Selected, go to Chart Tools>Format>Shape Styles and click on the drop-down arrow next to Shape Effects and select Shadow and choose Outer Shadow Offset Diagonal Bottom Right. 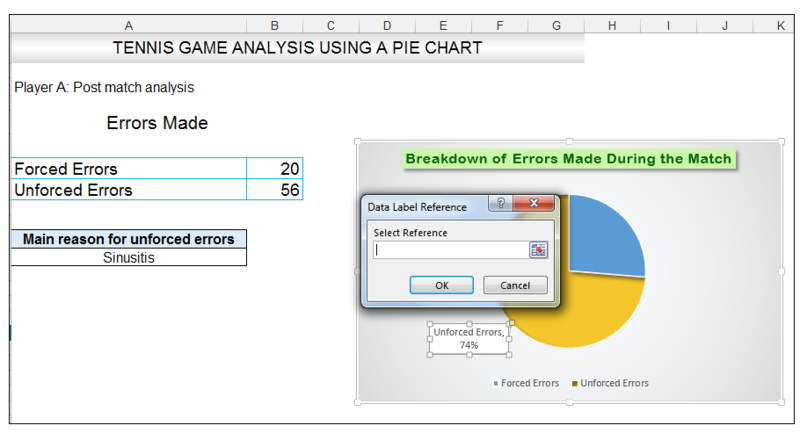 14) Select the other data point solely and right-click and select Format Data Point. 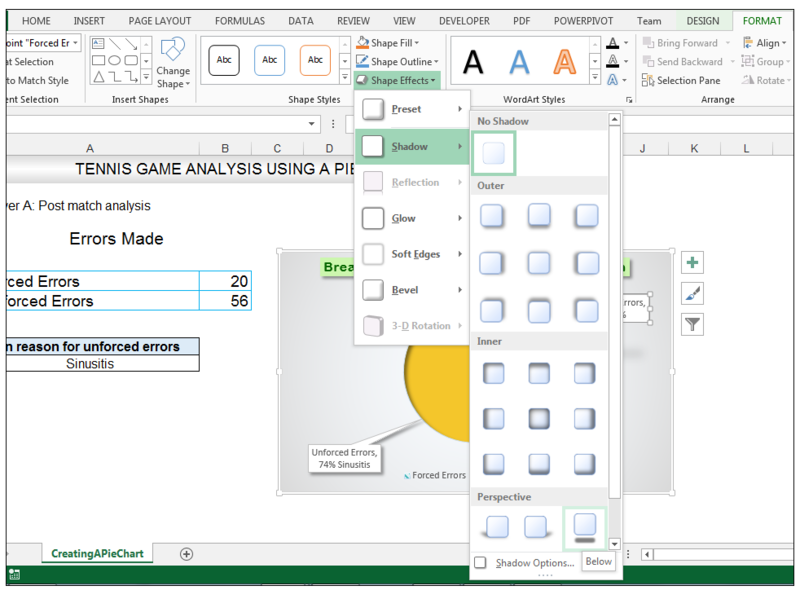 15) In the Format Data Point Panel, select Fill. 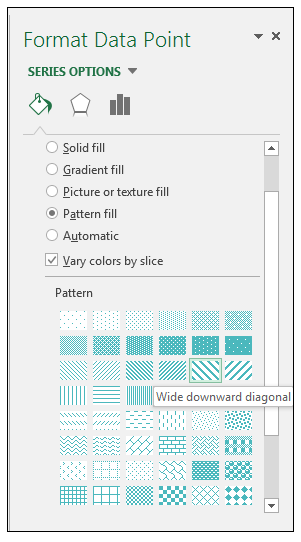 16) Instead of Automatic, choose Pattern fill, and select the Wide downward diagonal pattern. 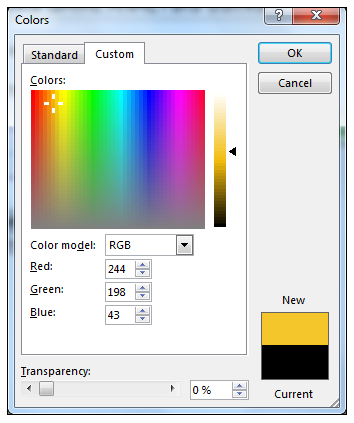 17) Change the foreground color of the pattern to R 74, G 184, B 189 and the background color to R 222, G 242, B 243. 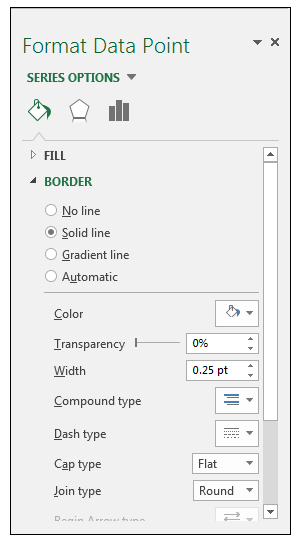 18) Expand the border section, with the data point still selected, and change the width of the border to 0.25 points as shown below. 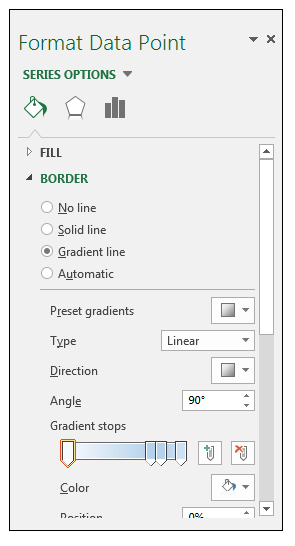 19) Select gradient line, instead of Automatic. 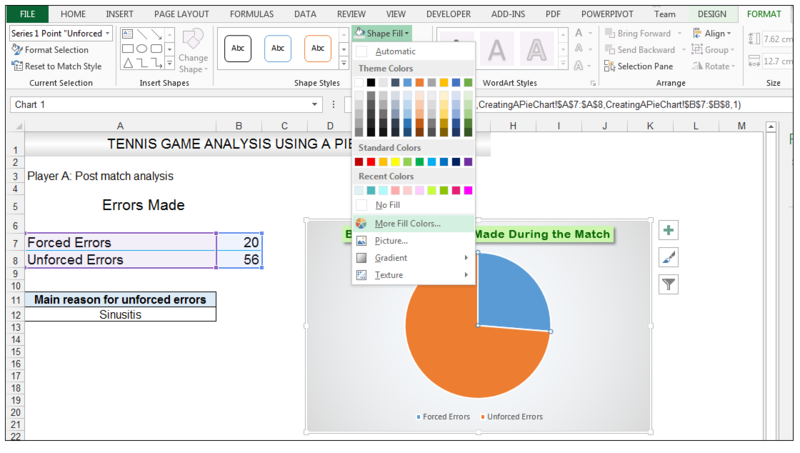 20) Close the Format Data Point panel, and add a Data Callout to this data point. 21) With the Data Callout selected, for this particular data point solely. 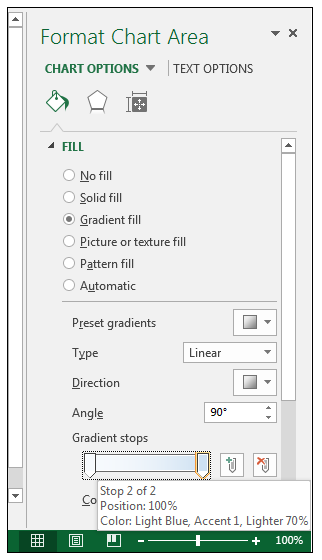 22) Go to Chart Tools>Format>Shape Styles and click on the drop-down arrow next to Shape Effects and select Shadow and choose Perspective>Below. 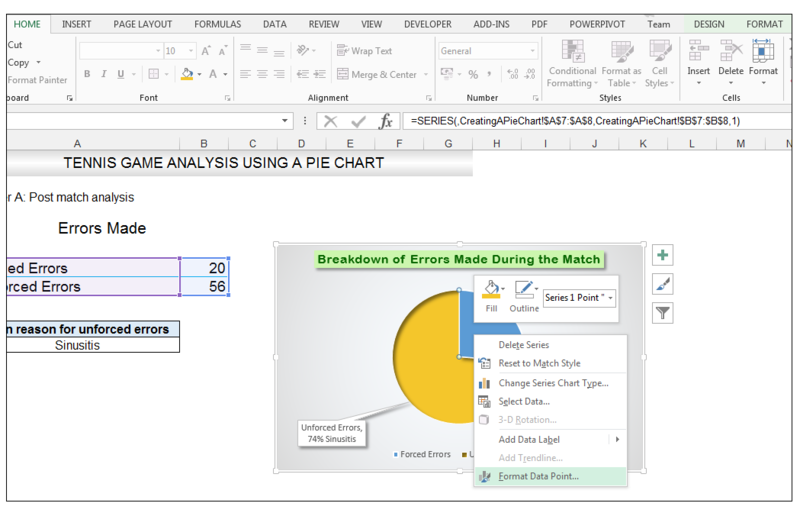 23) Delete the legend since the information needed, is already displayed in the data callouts and increase the size of the chart to 8.71 cm by 14.45 cm. 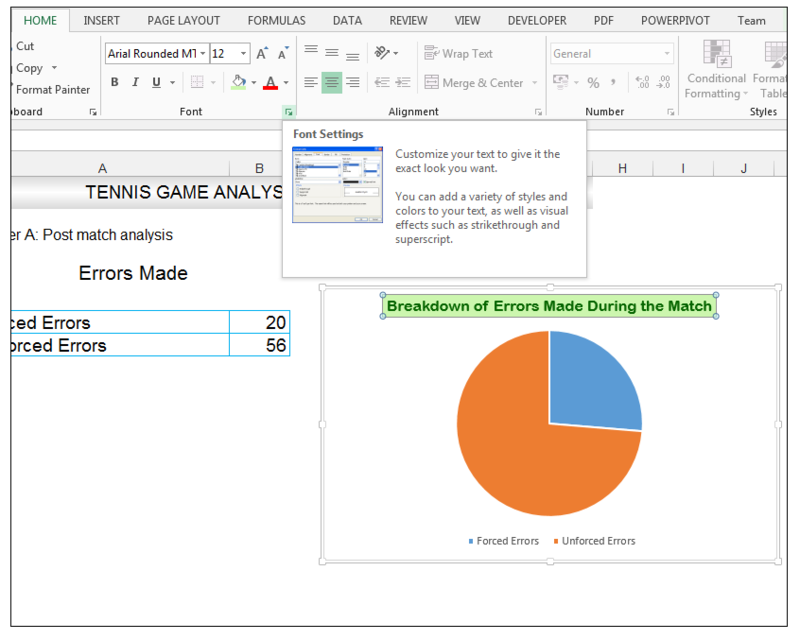 And there you have it, the tennis coach at hand now has an analysis of the match errors presented in a visual format and a way to hone in on what the unforced errors were due too. 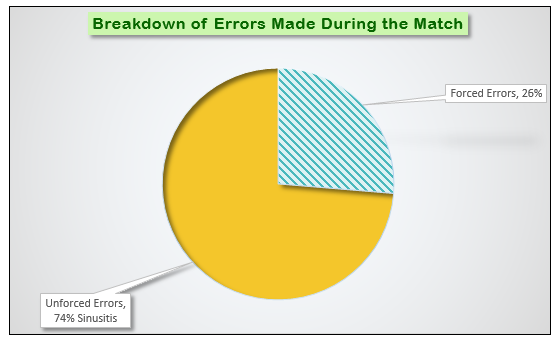 Let’s say post-match he discusses the performance of the player at hand with the assistant coach, and they decide the unforced errors were actually due to lack of concentration – they can update cell A12, and the reason for the unforced data point callout then updates automatically. Pie charts are useful ways of presenting parts of a whole. 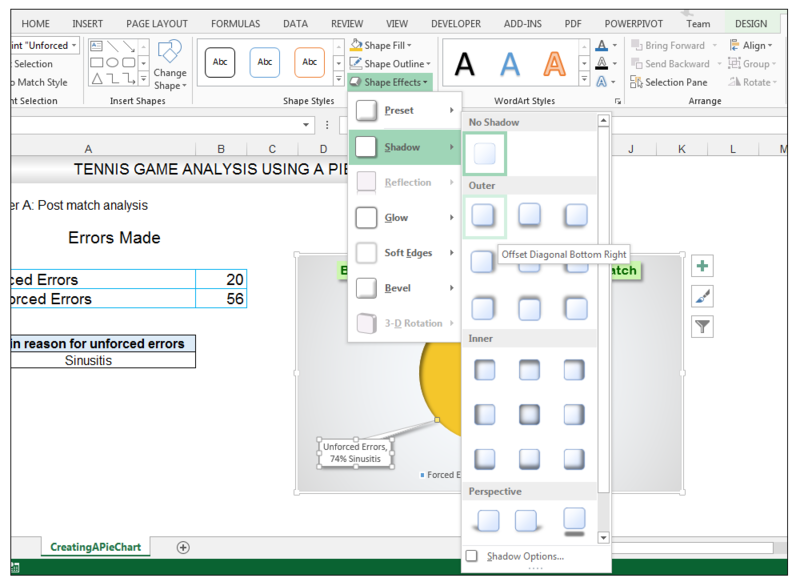 They are some of the most used chart types in reports, dashboards, and infographics. 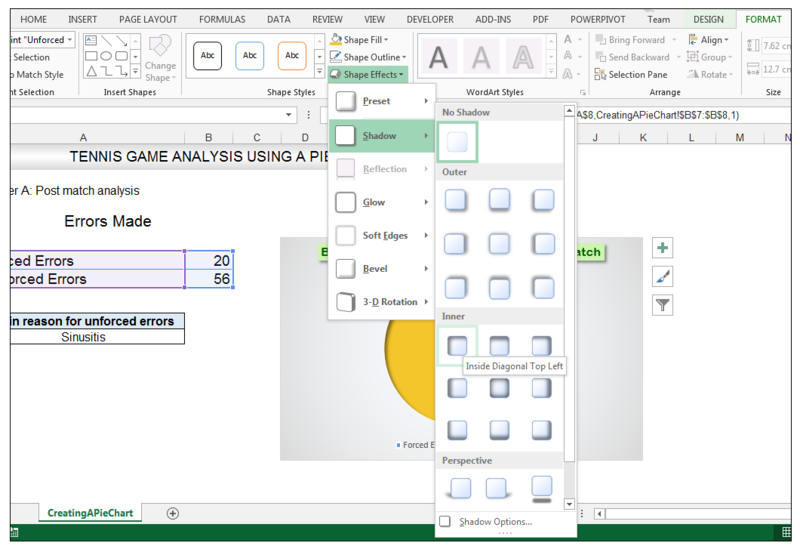 Excel provides a way to not only create charts but also to format them extensively so that they can be utilized with ease in presentations, posters and infographics. 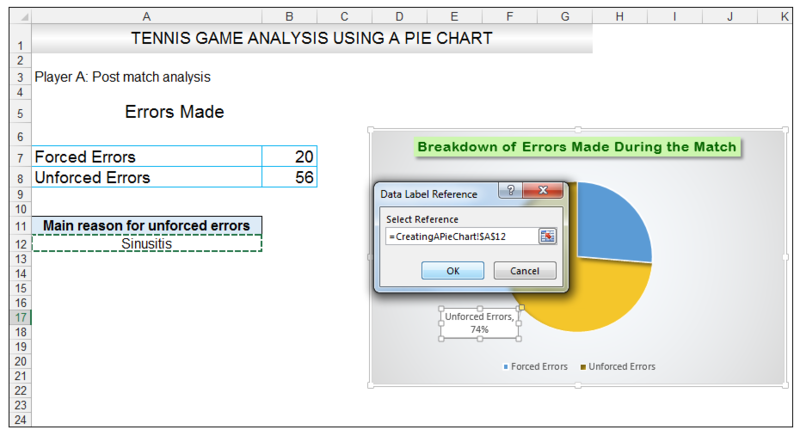 One can add rich data labels to data points or one point solely of a chart. 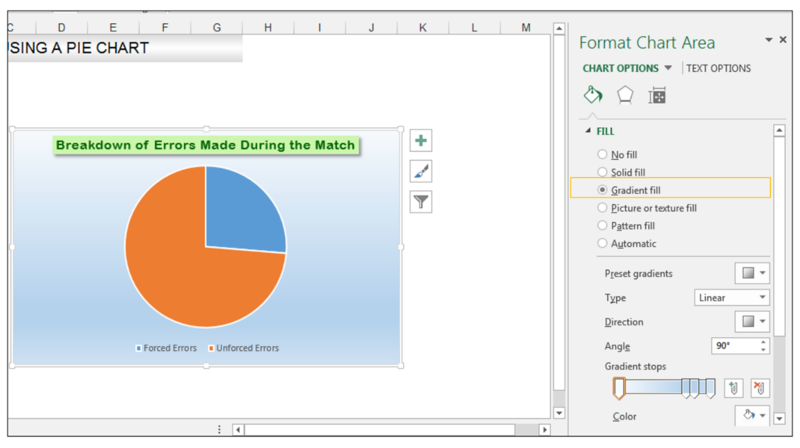 Adding a rich data label linked to a certain cell is useful when you want to highlight a certain point on a chart or convey more information about this particular point. 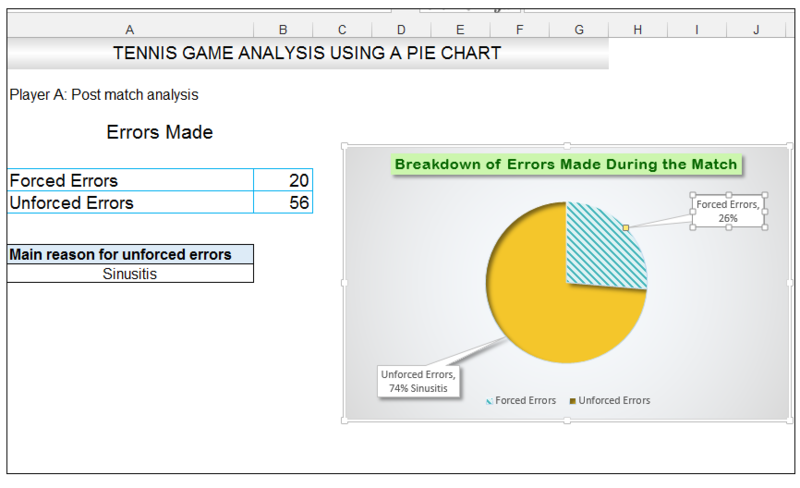 This can be utilized for statistical outliers as well, and one can label the outliers on a chart for example only in order to shed more insight on these outliers. 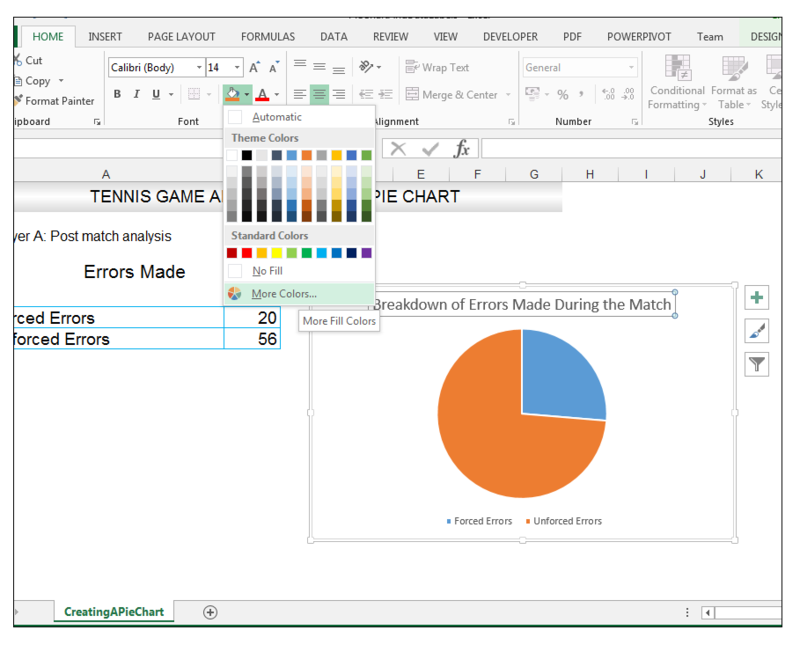 Please feel free to comment and tell us if you use Excel to analyze sports matches/games and the charts you use.